The holidays are here and there seems to be just endless ways to celebrate and get crafty. 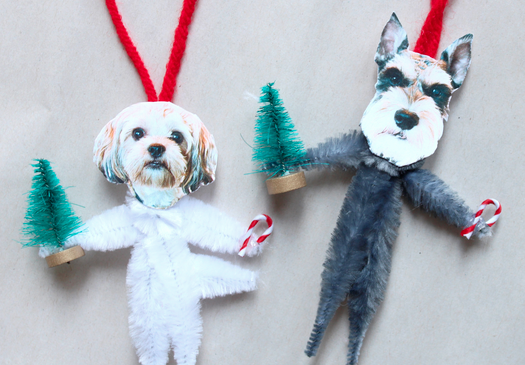 Here’s a unique way to get your paw-friends involved and make one-of-a-kind dog ornaments for your Christmas Tree or gift wrapping. 1. Using a tape runner with double-sided tape or a glue stick, attach a photo of your pup onto a postcard or other thick piece of paper so it’s nice and sturdy. Cut out your pup’s head. 2. Cut your chenille stem in half. 3. Take 1/2 of your chenille stem and bend it in half. 4. Take the other 1/2 of your chenille stem and wrap it around the top of the folded stem. Wrap it a few times until the arms are as long as you’d like them to be. 5. Using a glue gun, attach your pup’s head to the chenille stem body you’ve just made. 6. Use your glue gun to give your pup candy canes, trees or any other accessories you can think of! 7. Take a moment to admire your handy work and smile. Isn’t it adorable? Tags: crafts with kids, diy, dog lovers, Dog ornaments. Bookmark the permalink.